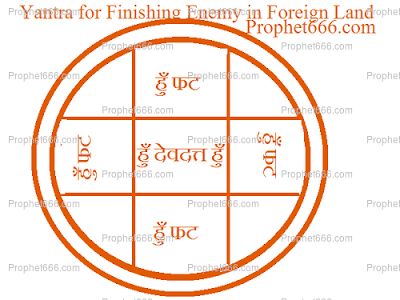 The Tantra for preparing and utilizing this Yantra is strikingly similar to another Enemy Killing Yantra, published on this site a few years back, that Yantra can be seen here – Enemy Maran Yantra. However, this Yantra is much simpler to make and use than the earlier one. The Yantra should be prepared of a Human Skull, using the blood of a goat, a piece of crushed coal from a Hindu Smashan Bhoomi and the ash from a funeral pyre as the ink and a feather of a crow as the pen. The name of the enemy living abroad should be written in the center of the Yantra in place of “देवदत्त”. The Yantra should be then kept is a secure place for 21 days, after which it should be burnt to ask and completely destroyed. This Tantra ensures that the enemy living in a faraway land falls sick and ultimately dies of the 21st day. Note- Article shared for the purposes of giving Tantra Knowledge, this site does not testify or justify the uses of such fearsome Tantra methods.